UK group, formed in 1963. Birmingham-born members of this band had jazz and folk-blues roots prior to developing an interest in the then-emergent R&B scene. They landed residency at the city's Golden Eagle pub, playing cover versions of material by Sonny Boy Williamson, Muddy Waters, Bo Diddley, and other black American bluesmen. Chris Blackwell, then trying to set up his own Island label, in order to cater for the West Indian market in the UK, discovered the group during his visit in Birmingham and, realising the ethnic basis of his own label, signed them instead to Fontana. Their first three singles were minor hits, then Blackwell teamed them up with songwriting talents of Jamaican ska star Wilfred 'Jackie' Edwards and the first collaboration, Keep On Running, took them to British No.1 slot in December 1965. The compulsive Gimme Some Loving helped them attain Stateside success while they became an established act on the UK club circuit. Their final hit came in February 1967 with the Stevie Winwood composition I'm A Man (later covered successfully by Santana). By then, psychedelia and flower-power had burst onto the scene and, like so many of his contemporaries, Stevie Winwood decided to move from a style of music totally derivative of American sources, and into something original, if, in retrospect, far less exciting. The result was the formation of Traffic with which Winwood achieved considerable success. His brother Muff moved into record production, initially with Island and later as the head of A&R at Epic Records' London office. Attempting to keep the group going, Spencer Davis brought in Eddie Hardin, keyboards, Phil Sawyer, guitar, and Charlie McCracken, bass. Hardin and York soon left to form Hardin & York duo and, after several further line-up changes and lack of success, Davis disbanded group in 1969. He immigrated first into Germany, then to California where he formed a trio with Peter Jameson and Alun Davies (even working with rural blues veteran Mississippi Fred McDowell at one point). In 1973, Davis met up again with Eddie Hardin in Los Angeles and re-formed Spencer Davis group but, despite reasonable well-received UK and US tours, this new incarnation was short-lived and Spencer Davis gave up his rock star aspirations, instead preferring to work as a West Coast recording executive. The Winwood Brothers and York had been in The Muff Woody Jazz Band. One night, at the Golden Eagle in Hill Street, they shared the bill with Davis, who was doing an acoustic country blues solo spot. They joined forces to form the Spencer Davis Group. Chris Blackwell, then handling Millie (of My Boy Lollipop fame) and trying to get Island Records off the ground, discovered the band and decided to manage them - signing them to Fontana, since Island wasn't yet ready to cope with their potential. Fab Brum-based R&B group. Their excellence pivoted almost entirely on Stevie, who had only just turned 16 when they went pro in April 64. Enjoyed growing cult following until Keep On Running made them stars at the end of '65. Made some wonderful singles. Magic combination. There have also been several re-issues and compilations, including The Best Of (Island ILPS 9070). The Winwoods had given plenty of notice before leaving but Davis must have sensed it would never be the same... and it wasn't. New singles lacked any of the distinctive quality which marked those by the earlier group - though they got a top 30 hit in Time Seller. Finally ground to a halt. Said Spencer: "I decided that the time had come to kill it before it was killed by outside forces". He recorded a couple of solo albums, went acoustic again, nearly formed a group with Jon Mark. Taken from: "Pete Frame's Rock Family Trees volume 2"
The original lineup was assembled in 1963 as a jazz-blues combo with the above listed musicians. Davis formed the band in Birmingham, having their residence at Golden Eagle, they started out with R&B and and achieved immediate success due to amazing vocal work by their lead singer Stevie Winwood. Between 1965 and 1966 they had two big hits with the songs Keep On Running and Somebody Help Me, and the founder of Island Records, Chris Blackwell, was their first producer. After their new single, I'm a man, Stevie decided to leave, to form Traffic, and his brother Muff started working as an executive for Island Records. Davis assembled a new lineup, with York on drums and Eddie Hardin on keyboards, Phil Sawyer on guitar, and Charlie McCracken on bass (ex-Taste). Soon after, Ray Fenwick replaced Phil Sawyer, and Hardin and York formed a duo, recording several albums. In 1969, after trying to recover lost success with a new rhythm section formed by Dee Murray and Nigel Olsson (both later with Elton John), Davis went to California, where he worked with Alun Davis (guitar, later with Cat Stevens) and Peter Jameson. He also recorded some tracks with bluesman Fred McDowell, but returned to the UK after that. 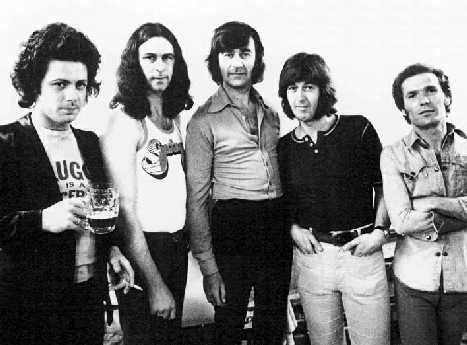 A new meeting with Eddie Hardin (who later would work, along with York and Fenwick, with members of Deep Purple, such as Jon Lord or Roger Glover) gave re-birth to the band, featuring Davis, Hardin, York, Fenwick, and occasional help from bassist John Gustafson. But the band left Davis after just two years and two albums, some of the members joining Ian Gillan Band. Since then, Spencer Davis has kept a relatively low profile. Whenever a big group splits up for a few years and then reforms, it seems that everyone is ready to lambast the new group for not recapturing the old sound. Well, round one is over for the Spencer Davis Group, and the near-unanimous opinion is that it's a solid, rock and roll band. Last year Spencer decided that he wanted to get back to rock and roll after three years of critically acclaimed (but commercially disastrous) acoustic music. He got Pete York (the original drummer) plus Eddie Hardin and Ray Fenwick (who joined the SDG when the Winwood Brothers left in 1967) and Charlie McCracken (from Rory Gallagher's Taste). The new line-up was greeted enthusiastically in England, Europe, and the United States during the initial tours. Part of the reason for the good reception is that the revitalized group still bases its music in R&B. Another reason is confidence: the new group isn't afraid to play their big hits from the past with their music of today because it all bears the unmistakable Davis stamp that has made the SDG, as much a part of British musical history as the Beatles, the Rolling Stones, and Rod Stewart. Despite personnel changes, the Spencer Davis Group has been around since 1960 when Davis and York were playing in Birmingham. They moved to London in 1965 when Stevie and Muff Winwood joined up, and in those early days, the band could do no wrong. They churned out hit after hit--almost all classics today. Hits like "Keep On Runnin'," "Gimme Some Lovin" and "I'm A Man." At the height of their popularity, the Winwood brothers split, with Stevie joining Traffic. "He had already been working with Traffic while he was with me. In fact, Traffic had been on some of our stuff, like the American version of "Gimme Some Lovin." The line-up then became Spencer, Pete, Eddie Hardin and Phil Sawyer, later replaced by Ray Fenwick. One album later there was another division, with Hardin and York forming a separate entity, and Dee Murray and Nigel Olsson (both with Elton John now) joining the group. This continued through 1969 when Davis formed an acoustic duo, first with Alan Davis (now with Cat Stevens) and then Peter Jameson. The duo recorded two LP's and then split. In 1971 there came a spell of personal problems for Spencer, including illness which forced him to return to England. He spent several months "counting grains of sand on Rhossili Beach" before seriously thinking about music again. When he did decide to start playing again, he returned to Los Angeles. Coincidentally, Eddie Hardin showed up there and suggested that they reform the band. That was the impetus Spencer needed, and the group went into rehearsals, and shortly thereafter recorded "Gluggo." While highly acclaimed, Spencer admits it could have been better if the group had done some live gigs before recording. But they have since done several tours, and the tightness of the band is evident on the new Vertigo album, "Living In A Back Street," produced by Roger Glover of Deep Purple. Obviously, the Spencer Davis Group in composed of five dedicated individuals. "You can't rely on past glories," Spencer says. "You've got to keep moving on and getting, better all the time. The band's really together now, people." Mulberry Bush is the collection of original recordings from the sessions of mid 1967 making up an album that could have been released in 1967. Instead the 1967 line up of the Spencer Davis Group only saw one single released during their time span , the rest of the tracks recorded at the time were issued across another single, a film soundtrack and an album in 1968 after the line up had changed again .A number of the recordings were thus altered before release. For full story , pics and memorabilia see fold-out inlay. This Album P.&C. 1999 RPM , a division of Cherry Red Records ltd , Unit 17 Elysium Gate West , 126-128 New Kings Road , London ,SW6 4LZ . I was projected into the '60s by Spencer Davis and Pete York, coming from various bands, very much on the outside looking in - I was suddenly on the inside looking out, a privilege I maximised both socially and musically. Prior to this, my first attempt was to audition for the Animals after Alan Price left, though I don't think I fitted in sartorially, I was from a 'mod' background and they were kind of 'Auf Wiedersehen Pet', if you know what I mean! Though not a fan of The Spencer Davis Group at the time, I was aware of their status, which was not that of a 'pop' group; they were not about hair, cars and clothes as so many were, they were about music 100% and they were held in high regard within the 'serious' music business. It was Spencer's idea to film promos for singles. For some reason Queen get total credit for the first pop video, but there were, in fact, many done in the '60s! Spencer's enthusiasm is boundless, and while he may not be the greatest technical musician, he has a great conceptual attitude. During my first recorded sessions with the band it was clear that Pete was not into the recording side, Spencer and I would sit up all night at Pye studios, Phil would go home after making his sometimes strange though valuable contributions. 'Time Seller', was recorded in segments and edited together; all we had initially was an intro and a verse, Phil arrived at the studio one night and said to me, "Don't speak! ", he then thumped about on the piano with his idea for the middle. He didn't know what the chords were though he knew in what direction they should ascend and descend; it turned out to be a complex set of changes, far removed from the Spencer Davis formula of 7ths and flattened 13ths or whatever, and was a very brave decision of Spencer's to put it out as a single. Graham Nash was at our early sessions, and the 'Time Seller' influence can be heard very clearly on The Hollies' "King Midas In Reverse". Had Phil been more 'focused' at the time, I feel the possibilities could have been endless and it's sad that we have so few tapes left of these early sessions. There were hours of 'jamming' at Pye studios though the tapes are long lost, or are they? There may be an engineer or a tape 'op' somewhere with the lot!! Spencer also pioneered the Speakeasy days (which didn't really happen 'til the early '70s) whereby visiting American bands would call on him as they passed through the UK. The Beach Boys' Carol Singing In Trafalgar Square' is one such project I remember. I went with Spencer to meet them at the Hilton hotel in London though the pre-Carol drinks kind of got in the way and the Hilton was as far as we got. Then there was The Monkees' visit to London, like them or loathe them, they did give a good party. I met Neil Diamond once in New York and foolishly criticised his contributions: he said, "I don't think the IRS or my bank would agree!" In America we toured with Mitch Ryder and The Detroit Wheels, The Turtles, Peter and Gordon, Tommy James and the Shondells and Sonny & Cher, to name but a few; it was a hectic though great period of creativity which I fear will never again return. New Face On album was ready for release, Sawyer had left the group, and so Davis insisted on recuts of several tracks where Sawyer had taken the vocals, to overdub new vocals. This compilation is the album of recordings that in effect make up the album of the group in 1967 . Hardin and Sawyer replaced the Winwood brothers, following auditions held by Davis. "I tried dozens of people for the group. I went to Liverpool and as soon as people saw my head round the door they knew what I wanted. I wanted Terry Reid of Peter Jay & The Jaywalkers, a great singer, but we couldnt reach an agreement," Davis told journalists at the time. Auditions were then held at the Marquee club, and Hardin remembers many brother acts turning up hoping to replicate the Winwoods; he also remembers one Elton John applying. Davis apparently liked his material if not his performance, and a couple of Eltons songs were recorded by the group. However, by all accounts, the resulting recordings were not that good and Elton was relieved they never came out. Hardins other abiding memory of the audition, apart from getting the job, was �100 in advance wages to get him started. For Hardin, the immediate live shows , TV work and soon recording sessions meant immediately being thrown in at the deep end. His career thus far had comprised a school band with mates, several Melody Maker small ads auditions and finally a mod band called A Wild Uncertainty who recorded a oneoff single for Shel Talmys Planet label . Talmy, famed for his production work with the Kinks and the Who, used the latter as a template for several other bands, and The Wild Uncertaintys sole offering was a version of "Man With Money", an Everly Brothers song, then-popular with Mods (and performed by the Who in their early days). The single made the lower reaches of the Top 40 , thanks mainly to the efforts of Eddies dad, his uncle, and various other assorted relatives who did the rounds buying up copies, and the band got to tour with the Creation. It really wasnt what Eddie wanted, however, and he left in the Summer of 1966 with the intention of going solo. "I wanted to get a band together and do a Georgie Fame thing," he told Melody Maker. Eddies uncle owned a Casino, which had become the haunt of musicians, and it was there that Eddie met Manfred Mann vocalist Paul Jones. "One day he mentioned that Stevie Winwood was contemplating leaving the legendary Spencer Davis Group  would I be interested?" Phil Sawyer was already well-known on the British R&B circuit, and so his first outings with the Spencer Davis Group were not so unfamiliar to him. He was previously a member of the Cheynes, a highly popular act which also included Peter Bardens (later of Camel) and Mick Fleetwood. Unable to secure a hit single, The Cheynes had disbanded in April 1965, after which Phil surfaced in (Les) Fleur Des Lys (he featured on their second single, "Circles", a powerful version of the Who song issued on Immediate in March 1966), leaving them within a few months to rejoin Bardens in Shotgun Express , a revue styled troupe centred on Rod Stewart and Beryl Marsden. It was actually Pete Townsend who put Davis in touch with Sawyer. New Face On album and Hardins vocals were used. The single, meanwhile, was released in controversy as their then label Fontana had plans to release a different track , "Back With My Baby", a hitherto rejected master featuring the old line-up. Though the new single did eventually come out on Fontana, the wrangle ended Davis three-year association with them. The group subsequently moved to United Artists, but the row hampered commercial prospects for the single, and this wonderful slice of English pop/psychedelia struggled to reach the Top 30, despite some good reviews. It was, however, a Top 10 smash in Holland, where it outsold a rival Traffic release, "Hole In My Shoe". 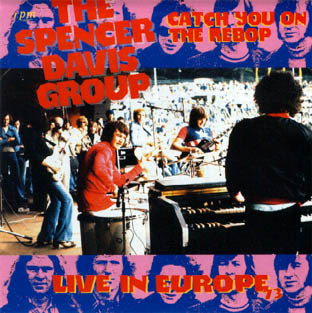 Indeed, the Spencer Davis Group spent some time on the continent to promote it, producing a promo film for the single and making a 45-minute documentary film in Germany about the events surrounding the changes in the line-up. and casting. There were no teenage film stars and no pop stars who could act sufficiently well, and United Artists were concerned about the budget. I said: Ill tell you what Ill do  Im going to use a lot of songs and Ill go through your list of pop groups and choose one that will promote their album and the film. They said, Youve got a deal. I took the Spencer Davis Group, and by sheer good luck Steve Winwood was splitting off at that time to form Traffic, and so I got two for the price of one  and it worked well". (Subsequently Traffic also had three songs on the soundtrack, plus Andy Ellison of Johns Children by virtue of his tracks producer Simon Napier Bell also being the Soundtrack music editor/producer). Hardin and Davis remember a meeting with Clive Donner during which Donner outlined the films scenario and described where he wanted music used and some basic titles. The group wrote a number of songs, then recorded them in the usual fashion of backing tracks recorded 'live' with vocals dubbed on afterwards. Hardin recalls that it was a very quick process, not much deliberation at all: "It was all done in about a week at PYE Studios in Marble Arch, and a bit rushed as I remember". Another contributor to two of the songs had been Eddie Mathews who co-wrote Every Little Thing and Possession. He was a University lecturer in Birmingham who had run a band in the early 60's giving Pete York his first musicians job. Davis had also been acquainted with him at the time and they had all kept in touch, thus for the Mulberry Bush soundtrack Davis turned to Mathews for some writing inspiration. The film also reacquainted the band with some of the films actresses who used to frequent the London clubs along with the pop stars of the day, noteably Sheila White who had previously appeared in the film 'Ghost Goes Gear' which had featured the Spencer Davis Group in the movie. In 'Mulberry Bush' the band appear again - this time limited to a de rigeur party scene with them dressed in white suits playing the song 'Looking Back' at a church social in a hall with a mirrored ceiling! 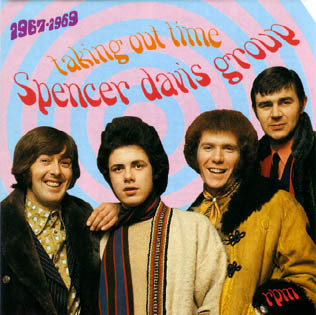 the released Soundtrack version of Taking Out Time features Davis on lead vocal, the alternate take has Sawyer on lead vocal. Pictures of Her has Davis and Sawyer taking alternate verses on lead vocal and the alternate take has just Sawyer on lead vocal. Further to this, the alternate take of Just Like Me has extra layers of guitar and a much heavier mix, while Posession is longer with a heavier fuzz guitar and different solo breaks on both guitar and drums - both versions have Sawyer on lead. Time Seller and its b-side, Don't Want You No More, both featured Sawyer on lead vocal. 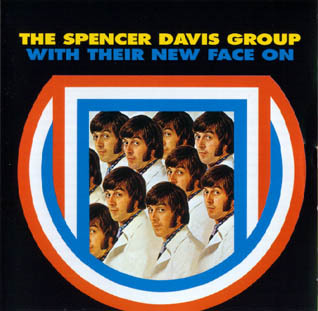 However, when both tracks were included on the New Face On album, they were overdubbed with Sawyers replacement Ray Fenwick on lead vocal for Don't Want You No More and Davis and Hardin jointly covering lead vocal on Time Seller. Morning Sun and Feel Your Way have Hardin on lead vocal for the released versions on the 'With Their New Face On' album, but included here are the previously unreleased original versions with Sawyer on lead vocal. The second single, Mr. Second Class, was also recorded during these sessions with Hardin on lead vocal and Sawyer playing guitar on the backing track. When the single was released, the picture sleeves of the European editions featured shots of the Sawyer line-up but by then he had left the group. "He was carted off to hospital and the Plaster Casters had to make do without the Spencer Davis Group in their collection". Following the US tour, more European dates were played and the constant touring got the better of Sawyer who at the end of the year announced his departure from the group, playing his final gig in Rotterdam. Whilst in Holland, Davis recruited Sawyers replacement - an English guitarist playing with Dutch band After Tea, Ray Fenwick. Fenwick arrived back in England one week later, in time to add some backing vocals to the otherwise finished master of the next single, 'Mr. Second Class', which was released on December 29th 1967. In February 1968, the 'Here We Go Round the Mulberry Bush' film and Soundtrack were released, and the 'With Their New Face On album followed a couple of months later . 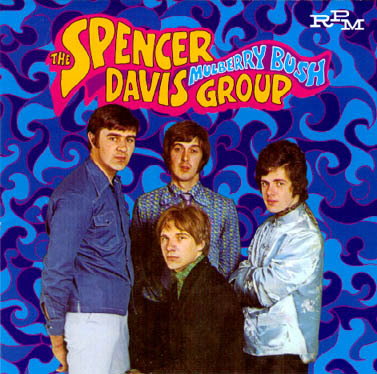 The April - December 1967 period of the Spencer Davis Group was eventful and productive, the singles produced scored great reviews and critical favour for their psych/pop musical style. However, the commercial success waned as the singles stalled in the UK at Nos 30 and 35 respectively, perhaps too much time had been spent in the US away from their home market, and perhaps the United Artists record label - which really only started as an outlet for the film soundtracks when they had been lucky enough to keep the Beatles A Hard Days Night and the Bond movies - didn't then have the right team to successfully promote pop acts. Following departure from the group, Sawyer became an A&R man for United Artists, later studying at a music college and in recent times has been very successful writing and recording for a string of advertising campaigns plus producing solo albums for Warners in the US. Hardin left the group in 1968 and formed a duo with Pete York which produced three albums as Hardin & York, gaining a particularly large following in Europe. Hardin later settled in France where one of his compositions was recently a big hit all over again when the song 'Love Is All' (from the Butterfly Ball album) was used in an advertising campaign there. York stayed in Germany following numerous tours there, where he has been living throughout the 80's and 90's, touring with his own bands and linking up with Davis whenever the latter tours European territories as the Spencer Davis Group each year. Davis himself is domiciled in the US where he has stayed since the 70's, working for Island Records LA office. 'Drink Gluggo - the Wonder Drink!' That was the jolly cry of rock'n'roll revellers during the Swinging Sixties, when rock stars descended on their favourite clubs for a night out. It was one of those phrases that caught on and in this case, ended up as an album title. 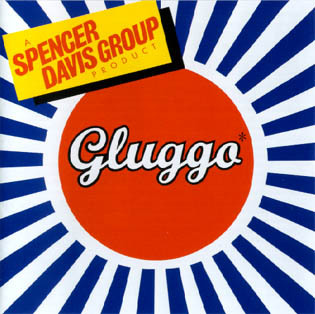 'Gluggo' was the new release by the revamped Spencer Davis Group which actually came out in 1973, some years after the Sixties had stopped swinging. Although Spencer Davis had broken up his group in 1969 and left England to live in America, the call of touring and recording remained strong. Spencer had been working as a record company talent scout and solo performer when Eddie Hardin, his ex-keyboard player, proposed they revive the band. Recalls Eddie: "I went to Los Angeles and we reformed the Spencer Davis Group with Ray Fenwick on guitar. We had Pete York back on drums, who had worked with me in Hardin & York. We also brought in Charlie McCracken from Taste on vocals and bass guitar. I thought it would be nice to do another tour of America and I did a deal with Phonogram to record 'Gluggo', which came out on their Vertigo label. The title came from a roadie called Baz (real name Barrington Marsh Ward) who worked with The Nice. He used the phrase Gluggo a lot as his favourite word for beer." The album was the belated follow up to 'With Their New Face On' (also available on Repertoire), first released in 1968. This helped re-launch The Spencer Davis Group after the departure of keyboard player and lead singer Steve Winwood, who left to form Traffic in 1967. Steve had been with Spencer since 1963. The Birmingham band became one of the most popular and successful R&B outfits of the period and enjoyed a succession of chart hits including 'Keep On Running', 'Gimme Some Loving' and 'I'm A Man'. When Steve left, the band was at the height of its fame and it was a blow to Spencer to lose his young protege. However, after a series of auditions, he found two fine new replacements, Eddie Hardin and Phil Sawyer. Hardin (then 18) a talented keyboard player, singer and composer, was recommended by Paul Jones, lead singer with Manfred Mann. Guitarist and vocalist Phil Sawyer had previously worked with Rod Stewart. The pair completed a line up that included Spencer on vocals and guitar and Pete York on drums. Muff Winwood, Steve's; brother, who had played bass in the old band, decided to quit and concentrate on A&R and production work. The new Spencer Davis Group enjoyed a Top Thirty hit with their first single "Time Seller" (1967), followed by 'Mr. Second Class' which was a minor hit in January 1968. They played at major festivals and concerts and toured America and Germany before Phil Sawyer left, to be replaced by guitarist and composer Ray Fenwick. After a few months, Eddie Hardin and Pete decided to leave to concentrate on their own band, Hardin & York, which became very popular in Germany. Spencer carried on for a while with Dee Murray (bass) and Nigel Olsson (drums), but in July 1969 Spencer broke up the band and Dee and Nigel went to work with Elton John's new group. Elton, incidentally, had been turned down by Spencer when he applied for the post vacated by Steve Winwood! The Spencer Davis Group was inactive for four years until Eddie and Spencer reunited to make 'Gluggo'. Recalls Eddie: "I thought 'Gluggo' was a much better album than 'With Their New Face On'. Me and Ray wrote most of the material, like 'Catch You On The Rebop' which was based on a blues riff. 'Don't You Let It Bring You Down' was a kind of 'Fool On The Hill' - type of job, while 'Living In A Backstreet' was a rock'n'roll shouting song. Ray and I wrote practically everything together and we still do. However, one of the tunes, 'Today Gluggo, Tomorrow The World', was an instrumental inspired by Pete, which as I remember, was very difficult to play! He wrote it with Lionel Rubin, a brass player who has a music shop in Birmingham." Several of the tracks, like 'Feeling Rude' and 'The Screw', retain a strong rock feel, although Eddie describes 'Mr. Operator as very much a pop song. "Me and Ray thought we'd write a hit and that one was released as a single. 'The Edge' was a B-side instrumental, nothing to do with U2! The last track, 'Tumble Down Tenement Row', was a blues written by Spencer." As well as the nine original album tracks, Eddie has recently re-mixed and remastered six special bonus tracks from the archives. "Ray and I wrote 'Alone' which is a ballad with a strong Bee Gees flavour. There were actually three different versions of 'Gluggo', including American, German and British versions, and the tracks were all jumbled up. I think 'Alone' was on the American version. 'Legal Eagle Shuffle' was a contribution by Spencer written during a time when we were being sued by everyone and we were suing them. It involved record companies and publishers - oh, it was chaos! Spencer also contributed 'Trouble In Mind', which was an old standard folk song. 'Touching Cloth' was an instrumental by Pete and the second 'Mr. Operator' is a rough mix of our commercial pop song." The band toured the States and Europe and went on to produce one more album, 'Living in A Back Street', produced by Roger Glover of Deep Purple and released in 1974. Sadly, the band failed to get anymore hit singles and says Eddie: "I think we spent too much time in America and we sort of disregarded Europe. But we had a good time. We toured with Genesis when Peter Gabriel and Phil Collins were in the band and we played at the Madison Square Garden in New York with Focus. The band eventually just fizzled out and I left for the second time, in around 1975. That's when I started to get involved in studio projects and worked with Roger Glover on the 'Butterfly Ball' album. I ran my own commercial studio in Ascot for some years and recorded artists like Rick Wakeman, Tony Ashton, Steve Hackett and Donovan. Then there was a slump in the property market in England in the late Eighties. I got married and decided to move to France about six years ago. I like the people and the quiet way of life in France. I still record myself and made a CD with Pete York called 'Still A Few Pages Left'. In the Nineties, The Spencer Davis Group is still a going concern and regularly tours, mainly with American musicians. However, Pete York, who now lives in Germany, occasionally plays the drums for his old friend, and other British musicians who lend Spencer a hand include singer/guitarist Miller Anderson (ex-Keef Hartley Band) and bassist Colin Hodgkinson (ex-Whitesnake). Eddie Hardin still has fond memories of his time with the Spencer Davis Group, although there were some less happy moments. "I always enjoyed the recording, but I hated the travelling. It became a non-stop grind, night after night. Our managers had no regard for distance. We'd be travelling thousands of miles a day and it just became complete lunacy. You can handle it when you are 20 years old, but eventually it becomes too much. I remember on our first tour we travelled by Greyhound bus. Spencer thought that would be the economical way of doing things! Later we would fly everywhere, but two thousand miles a day is still a complete pain. The poor road crews had to travel by bus with all the equipment including my Hammond B3 organ. Nowadays I guess touring is a lot more streamlined. They have proper catering and we didn't have any of that." Many thought that a bigger problem for Eddie Hardin would be having to replace Steve Winwood, who was such a celebrated figure. But says Eddie: "No it wasn't, not at all, because I never actually liked the Spencer Davis Group! I wasn't a fan. When we started out, Spencer gave me a pile of their old records and obviously Steve was great but I wasn't in awe of him. I first met Steve when the Spencer Davis Group was doing a package tour with The Hollies. I went round on the tour to meet everyone. I still speak to him occasionally and wanted him to do something on an album I was doing last year and we nearly got it organised. He is still singing great." In 1997, Eddie Hardin was planning to work with his old guitarist and colleague Phil Sawyer and record some blues material together. But for the moment he is pleased to raise a glass of Gluggo and drink a toast - to the good old days! When The Spencer Davis Group reformed in 1973, a few eyebrows may have been raised. Firstly, this was long before the age when it became not only de rigeur but almost compulsory for ex-bands with chart success to give it a few more years (often for longer than they were ever together in the first place!). Secondly, the line-up which reformed was neither the most successful nor even the final one who had called it a day back in 1969. 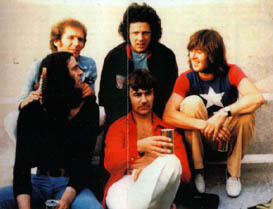 The 1973 reunion featured the four members from a mid-innings line-up from 1967-68, namely SPENCER DAVIS (rhythm guitar, vocals); RAY FENWICK (guitar); EDDIE HARDIN (vocals, keyboards); and PETE YORK (drums). Whereas bass duties in the original band had been covered by Hardin's keyboards, added for the 1973 unit was bassist CHARLIE McCRACKEN - more about him later. The full story of the original SDG line-ups can be found on the sleevenotes to their RPM CD "Taking Out Time", which includes many out-takes and radio sessions from 1967-1969. However, it's probably worth recapping slightly for new readers. The original Spencer Davis Group - Davis, York, STEVE WINWOOD (vocals, guitar, keyboards) and MUFF WINWOOD (bass) formed in Birmingham in 1963, securing a management and recording deal with future Island Records supremo Chris Blackwell, who signed them to Fontana. Their live popularity was enough to ensure that three of their first four singles made the lower reaches of the charts, but it was with a trio of songs by Jamaican songwriter Jackie Edwards "Keep On Running" (no. 1), "Somebody Help Me" (no. 1) and "When I Come Home" (no. 12) that the band made their major breakthrough. A slight change of style and moving to their own material made no difference to their popularity when "Gimme Some Loving" (no. 2) and "I'm A Man" (no. 9) hit the charts (and in fact are probably their best-remembered singles today). Additionally, the band's first three albums all made the Top 10. Winwood soon found his role as frontman restrictive, however, and having found he preferred the laid-back jamming approach he had discovered with some friends from Birmingham, quit the Spencer Davis Group in April 1967 to form Traffic. Elder brother Muff followed him out of SDG shortly afterwards, moving into A & R and production for Island. After numerous auditions, Davis and York recruited PHIL SAWYER (ex-Cheynes/Shotgun Express) on guitar and EDDIE HARDIN (ex-A Wild Uncertainty) on vocals and keyboards. A classic single, "Time Seller", failed to reach higher than No. 30, and by the end of the year Sawyer had quit the band to be replaced by RAY FENWICK. Fenwick had been in various bands, including The Syndicats, playing the remarkable solo on their "Crawdaddy Simone" single. Earlier in 1967, however, he had moved to Holland and played with The Tee Set (whose first LP "Emotions" is available on RPM) and its spin-off outfit, After Tea. The 1967-68 quartet had released two singles (the excellent "Mr. Second Class" and a cover of After Tea's "After Tea" which additionally featured two members of Traffic) and an album, "With Our New Face On", all of which were critically well-received, but failed to emulate the sales of the band's first era with Stevie and Muff Winwood. Two more line-ups featuring Davis and Fenwick struggled on, releasing one final single and recording a never-released LP "Letters From Edith" for CBS (which actually got as far as being allocated a catalogue number - CBS 63842 - but only appeared for the first time on the RPM "Taking Out Time" CD) before the SDG split for good in late 1969. Hardin and York in the meantime had formed a duo called, erm, Hardin & York. Their full history is available on the three RPM CD's, featuring their first two LPs ("Tomorrow Today" and "The World's Smallest Big Band") plus a live set ("Live At The Marquee"). While none of their records charted in the UK, the duo had an enormous live following, particularly in Germany, where they could fill the country's largest venues with ease. What then of the man who had given his name to The Spencer Davis Group? Following the collapse of SDG in 1969, Spencer moved between England, America and Germany, pursuing a solo (or more often than not a duo) career. Returning to England in 1970, he worked first with Alun Davis (best known for his work with Cat Stevens) and then Peter Jameson (best known for his work with Dory Previn), with whom (and various old blues musicians) he released the album "It's Been So Long" (UNITED ARTISTS UAS 29177, 7/1971), ironically on the label which had been home to the Davis/Hardin/York/Fenwick-era SDG releases. A follow-up LP, "Mousetrap" (UNITED ARTISTS UAS 61393, 6/1972) was credited to Davis alone, although again it featured Jameson, plus various L.A. session musicians. It was during an American tour with Jameson in late 1972 that the idea for the reformed Spencer Davis Group took root, as Eddie recalls, "Hardin & York was obviously the vehicle to make money, so we reassembled, considering the idea of an extra musician, but that didn't really work. Another lull ensued, and I began to think about a career with perhaps a more stable background. I invested some money with my brother John, then a director at Christies, in a small but thriving antique business which we ran from the home we had jointly purchased. "Later, John, sensing that I had become disenchanted with the art world, suggested we go to California to speak to Spencer again with a view to putting the old band back together again. I explained that the split had not been a happy one, and Spencer probably wouldn't even wish to meet me. John insisted he could talk to Spencer and that he would be the go-between initially. They had their first meeting and to my surprise, Spencer welcomed the idea of a "Hello Again" tour! "I had already dug the footings for a serious record deal with Phonogram, so negotiations were a mere technicality. I had approached Mike Hurst, at the time Head of A&R at Phonogram, with a view to pursuing my own solo career, though when it was mentioned that Spencer was also available, enthusiasm for both projects ran high. Within days, Spencer was flown from America, myself and Ray Fenwick had written the first single and we were in the studio." Added for the 1973 unit was Irish bassist CHARLIE MCCRACKEN. McCracken had come to prominence firstly as a member of the enormously popular trio Taste (until Rory Gallagher took off for a solo career), and then with Stud, a short-lived unit which included Jim Cregan (who went on to join Family for their last LP "It's Only A Movie" on which McCracken also appeared). McCracken did make a large difference to the proceedings, at least where Pete York was concerned, as he told a reporter from Downbeat Magazine in March 1974: "I think the drummer can get tremendous excitement with the rhythm section just being straight and solid. Now with Charlie on bass, if he has a good pattern going and it's getting through to me, then I'll sort of jump onto it and ride it for a while. Hopefully that might get through to the rest of the band. I play fairly straight behind the soloists where possible; then as things get going I'll build a bit. This happens a lot behind Eddie, for instance. Now I've known Eddie for years so I know how he likes to work. I know by the way he plays a phrase that he wants to be followed on it rather than my just playing time behind it. He wants me to phrase it with him. But when someone is soloing you just can't come blasting in at a high level and hope to maintain it." However, despite the dominance of the three ex-Hardin & York members, the new band was quite different from that outfit. Although in the studio Hardin & York had increasingly moved towards Hardin's shorter song-based material as opposed to the extended improvisatory pieces of the early albums, the Spencer Davis Group was a song-based outfit from the start. According to Ray Fenwick, the plan was to gain real hit singles once more. "We were really trying to crack America," he admits, "and really, you need hit singles in America to get anywhere. Singles are a real door opener over there." Even in concert only one piece was extended beyond the five-minute mark, evoking the classic Hardin & York direction, and whereas an instrumental like "Gluggo" might once have been turned inside out in concert, in SDG's hands the number always stayed at its LP-version length. Nothing from this line-up's SDG LP "With Their New Face On" from 1968 featured in the live set, although three of the four Winwood-era Top 10 hits were included (and you'd hardly need to be Mystic Meg to work out what they were! ): "Keep On Running", "Gimme Some Lovin"' and "I'm A Man". While the first two were played relatively straight, "I'm A Man" featured a long improvised section in the middle (which they came to call the "Man Jam"! ), leading to Pete York's solo spot, with the entire number lasting anywhere between 10 and 30 minutes. It's hard to say whether the reformed SDG initiated the deal with Phonogram or the record company interest initiated the reunion - the correct answer is probably both. "It was our idea, not Phonogram's," says Ray, "but getting back together with Spencer was the catalyst to that deal, and also the idea went down very well in America." The band quickly signed to Vertigo Records (Phonogram's new version of Fontana, SDG's original label) and lost no time recording an album for the label, mainly featuring the fruits of the Hardin/Fenwick songwriting partnership. "By the time it came to the Spencer Davis Group the second time around, Ray Fenwick and I had developed our writing skills into a serious craft and could write a song at the drop of a hat," says Eddie. "We had a big cellar below our house, so I piled in all the Hardin & York equipment and Ray and I began to write more songs down there," says Eddie. "[My American girlfriend] Marlene had a habit of saying "Catch you on the rebop" at the end of every telephone conversation, so this was one of our first songs to emerge from the cellar." "Catch You On The Rebop" was a strong and catchy number, and was released as the band's first single in March 1973. However, despite much deserved radio play, it failed to break the charts. Nevertheless, the single had attracted good reviews and had served as an excellent calling card to show that the SDG were back and in business. Eddie remembers that the reformed band's first LP "Gluggo" (complete with sleeve amending the classic "Brasso" polish tin) was not without its setbacks. "We spent days and nights of constant recording and experimenting, not always with good results, and especially in the light of spiralling costs. Bearing in mind that The Animals had recorded "House of The Rising Sun" for about BP20, we were probably wasting vast amounts of money. Spencer always insisted on using the same engineer whose name I won't mention as he is still a prominent figure, though fortunately on the business side. He was absolutely clueless and often fell asleep during takes." The band eventually awarded themselves the production credit, although it could have been slightly different. Eddie goes on: "I was at home with brother John when the phone rang. It was for Spencer who was staying with us at the time. The voice said, "Is Spencer There? ", but he wasn't, so I said, "Could I take a message?" The caller continued, "Sorry I missed him, but come to Abbey Road this evening". It suddenly clicked that I had been speaking to the great man himself. Thus Spencer and I set off that evening for Abbey Road where Paul McCartney was finishing off his album, "Red Rose Speedway"! "Another meeting was arranged at Paul's house in London, the idea being that he produce the forthcoming Spencer album. His studio or whatever setup he had was in Scotland, and he seemed apprehensive about a band turning up and disrupting his family life. McCartney was pretty non-commital, so we left his house not knowing if he had agreed to produce us or not. We gave up all hope on him although some months after the band had drifted apart he rang me up asking when we planned to start production!" Although uneven, I wouldn't part with Gluggo even if someone were to offer me a couple of mind Syd Barretts. Spencer Davis and his hand-picked crop of veteran roadsters have filled a place in my head that's been empty recently - the part that thrives on unadulterated good-timey pop music with a beat." The single and album completed, the band set off on various European dates. This, however, was to cause some confusion in Germany where Hardin & York were still a household name. Eddie again, "Germany was the first of our trips, though the Germans seemed more intent on listening to the music of Hardin & York. Subsequently, we were to be the opening act, although this didn't work out too well as we also proved to be the closing act too! This was a very confusing time for all of us, I think, as Pete and I were beginning to wonder if we'd done the right thing in the first place by reforming the Spencer Davis Group when it appeared that all the audience wanted to hear was us anyway!" A second single from the album, "Don't Let It Bring You Down" (backed with the still-unreleased "World") was scheduled in May 1973, but was replaced at the last moment by the non-LP Hardin/Fenwick track "Mr. Operator". (This might seem strange nowadays considering the LP was due at the same time, but in those days it was generally reckoned that people wouldn't buy the single if it was also on the LP - how times have changed!). 1973 was a busy year for the band. Although they regularly played in Britain, not surprisingly they concentrated their fortunes largely on America. 1973 alone saw three US tours including two large tours with the Dutch band Focus (May and November) plus a Summer jaunt on their own. That Summer also saw the band go back into the studio to start work on their second album, this time produced by the recently-sacked Deep Purple bassist Roger Glover. 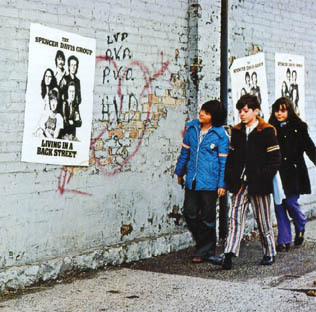 The title track of the album, "Living In A Back Street" was released as a single in October, although the album was a long way off. "We released the single "Living In A Back Street" because we were really pleased with it, but we hadn't finished the album at that time. We still had a couple of months more work to do on it," explained Ray. When it was finally released, the album had a greater unity than the first, partly because of Glover's production, but also because less studios were utilised. "I have always preferred to settle into one studio and work there all the time," says Eddie. "Spencer, however, worked all over the place - Pye, Advision, IBC, Olympic, to name but a few. Our best sessions, in my opinion, were at Ramport Studios, owned by The Who. We recorded "Living In A Back Street" there which was produced by Roger Glover. We used an American engineer who was pretty laid-back, if not laid down! "Recording for us was a very social event, and we had to have a couple of skips to handle the empty bottles and discarded takeaways. On reflection, the crap we used to import into the studio for our meals was quite frightening. There were curries and awful Chinese concoctions, splattered liberally by dreadful quasi-Greek food." The LP did not gain a release until June 1974 (eight months after the trailer single!) by which time the band were virtually defunct once more. As Eddie reflected: "America over with, our enthusiasm began to wane yet again. This had not turned out to be the huge money-making machine we had all anticipated. The band now split into two definite camps, myself and Peter and Spencer and Ray, Ray still determined to continue with the Spencer Davis Group Mark 9 or whatever. Charlie sat baffled in the middle, undecided as to which camp could offer him the best deal." Ray Fenwick doesn't remember it quite like that, seeing the end as not so much a split as a drift. "Pete moved to Germany and Spencer moved back to the States. He'd always hankered after that, and in the end we all just went our separate ways. There was no bad feeling or anything. I think if we'd had the hits and everything, and managed to crack America, we'd have carried on. What you must remember is that really we were a very good live band, and also a good social band." "When we were touring in the States, it was the time at the beginning of bands like the New York Dolls. [Most of SDG attended a notorious launch party for that band in New York - Spencer himself couldn't get in!] It was heading towards the Punk era, and we could see that bands like ours were soon going to become unfashionable. A lot of bands from our time moved into something totally different." Spencer Davis moved into A&R work. Only one recording project has been heard from him since: in 1978, he recorded an album called "Allegiance" for Peter Stringfellow's Allegiance label, which spawned a near-bit in the form of a cover of the 1968 Judy Clay & William Bell hit, "Private Number", which he performed with Dusty Springfield. Ray Fenwick became involved with the short-lived band Fancy who scored a major US and minor UK hit with a cover of the Troggs' "Wild Thing". He then got involved in a number of projects, as well as working with Jon Lord, Roger Glover and spending a couple of years in the Ian Gillan Band. Eddie Hardin released a couple of solo albums ("Wizards Convention" with its all-star cast and "You Can't Teach An Old Dog New Tricks"), and became closely involved with Roger Glover's "Butterfly Ball" album (which spawned the hit single "Love Is All"). More recently he has had further success with a musical of "Wind In The Willows" and a couple of New Age albums issued in Japan. Pete York moved to Germany, organising three sets of televised drumming masterclasses called "Superdrumming". Several albums were released from these. Charlie McCracken went on to play with Medicine Head and Kevin Ayers as well as appearing as a session bassist on many records. 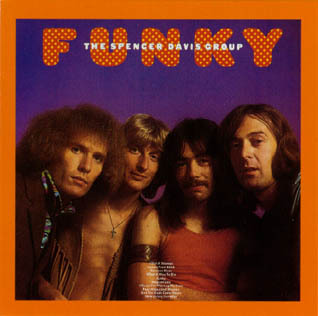 This CD features the 1973 Spencer Group across the whole reunion, taped by the band. As well as alternate takes of five tracks apiece from "Gluggo" and "Living In A Back Street", it also includes versions of the single-only "Mr. Operator" and two hits from the Winwood era: "Gimme Some Lovin'" and the extended (although not as much as it often was!) "I'm A Man". Some reunions work better than others. As proved here, the 1973 Spencer Davis Group did not discredit the name from their illustrious past. With a little more success and giving themselves time to gel once more, the reunion could indeed have caught us on the rebop and been a major British force to be reckoned with. 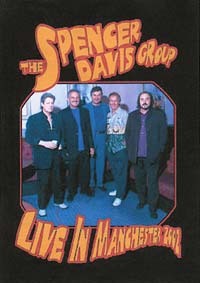 48 shows in 43 towns and cities in the space of 53 days - this was the Spencer Davis Goup tour in the Spring of 2002. The concert captured on this DVD was shot at Bridgewater Hall, Manchester in front of a sold-out audience. Back together again, Spencer Davis, Eddie Hardin, Pete York were joined by Colin Hodgkinson and Miller Anderson (who joined in 1985). Added to the live footage is a rare bonus 55 minute documentary from 1967 which also fleetingly features Mick Jagger and Noel Redding. The Spencer Davis Group go back to the heady days of the 1960s when they were primarily an R&B band who had several pop hits, and very good hits they were, such as 'Keep On Running', 'Gimme Some Lovin'' and 'Every Little Bit Hurts', all of which are included here. The current line-up of the band features most of the original members, minus Steve Winwood of course, who went on to have a very successful solo career. This live concert, recorded in March 2002, sees the current line-up performing a solid set of hits and standards such as 'House Of The Rising Sun'. One highlight is 'San Francisco Bay' sung by Colin Hodgkinson. Miller Anderson has been with the band for several years and is well known to Ian Hunter fans as a mate of Ian's going back to the 1960s when he was in bands with Ian and Freddie 'Fingers' Lee. Also on this DVD is a generous helping of extras, including a documentary from 1967 and recent interviews with Spencer Davis, Pete York and Eddie Hardin. With a total running time of 2 hours, this DVD is good value for your money. Picture quality is excellent but my only reservation is that the sound is not multi-channel, i.e. no 5.1 or DTS; but this is a 60s band after all, and that was not invented then! My first experience of an Angel Air DVD has been very positive, and I look forward to more great titles from the Company!